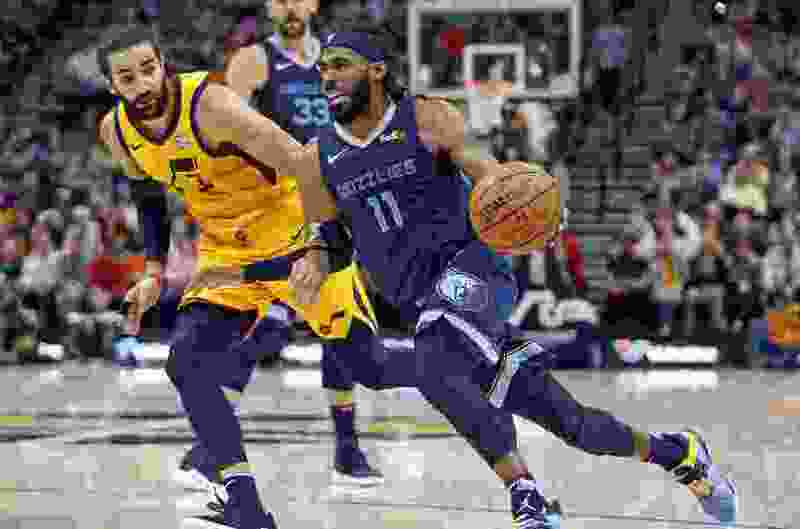 Minneapolis • In the minutes after he had snapped a frustrating early-season run of futility with a breakout performance in New Orleans, Jazz point guard Ricky Rubio was asked if he was a harbinger of sorts for the team as a whole. Is it really as simple as when he plays well, the Jazz play well? “Well, when Donovan [Mitchell] plays well, we win every game, too,” Rubio quipped. Thing is, there may be something to it. That night against the Pelicans, Rubio put up 28 points (on 8-for-14 shooting), 12 assists, and six rebounds, and Utah dominated for most of the night. In his second-best game this season, he totaled 13 points and 10 assists vs. the Warriors — a game in which the Jazz scored 81 first-half points and, but for a last-second tip-in, would have toppled the two-time defending champs. As for his other games … one point on 0 for 4 from the field vs. the Kings; six points on 1 for 8 against the Grizzlies; four points while shooting 1 of 8 in Houston; and, immediately after breaking through in New Orleans, six points on 2-for-9 shooting in Dallas. Coincidentally or not, Utah had some offensive inconsistency in those contests. So then, going into the finale of a four-game road trip Wednesday night vs. the Minnesota Timberwolves — the franchise where Rubio spent the first six seasons of his NBA career — with Utah looking to extend its winning streak to four games, what can Rubio do to get on the right track again and stay there this time? According to the 28-year-old Spaniard, the tape doesn’t lie. “I watched film and was seeing that almost all the shots I was taking, it was too much, forcing, wanting to score — and I’ve got to let the game come to me,” Rubio said. His shooting has been regarded as his Achilles heel since he’s been in the league — and deservedly so, considering he’s a career 38.4 percent shooter from the field and 32.5 from deep — but there has been some evidence of improvement in recent years. However, in this season’s first six games, the numbers are not good. He’s averaging 9.7 points and 7.5 assists, but converting just 30.9 percent of his shots, and 33.3 percent of his 3s. And if you take away the Pelicans game — the only one this year in which he’s made more than half his shots — he’s scoring just 6.0 ppg on 22 percent shooting from the field. Rubio knows his offensive efforts remain a work in progress. “Of course, as a point guard, I’ve got to be more regular,” he said. In the meantime, he’s trying to make other contributions on the court. He had five assists against the Grizzlies. He bumped that to six vs. the Rockets, a game in which he drew praise from head coach Quin Snyder for a strong defensive effort that forced reigning league MVP James Harden to work for his points. He also put in eight dimes vs. the Mavericks. Change a few nouns and pronouns in that sentence, and it applies pretty well to Rubio himself so far this season. About the Jazz • They are going for a sweep of their road trip after winning the first three games in Houston, New Orleans, and Dallas. … So far this season, Utah is 0-2 at Vivint Smart Home Arena, and 4-0 away from home. … Center Rudy Gobert is off to an incredible start, averaging 17.7 ppg, 13.5 rpg, and 2.7 bpg, while shooting 75.0 percent from the field. About the Timberwolves • Minnesota is coming off a 124-120 win against the Lakers on Monday night. … Embattled wing Jimmy Butler, who demanded a trade prior to training camp, scored 32 points vs. Los Angeles, and Karl-Anthony Towns added 25. … Last season, the Wolves broke a streak of 13 consecutive seasons without qualifying for the playoffs. They fell 4-1 to the Rockets in the first round.